You will not believe it but earning money is a matter of how you think about money. The more you think about it, the more you will create a relation towards it. Having a relation to money is fine, but you cannot let it become a romance. Do not let it become a love story because you will get heartbroken. Why? I will tell you in second. You want to keep a respectful distance and a relation towards money that resembles a platonic friendship you have with a person close to you. The great thing about this relation is that you can easily detach (connect) and attach again (disconnect), like a loose end. Sometimes you see this friend only a few times per year but when you do it is a big celebration and a gigantic volcanic eruption. No deep feelings, no bromance, no deep emotional involvement and not making a big deal out of things (no drama) are the key pillars for a functioning friendship and a good relation with money. That is why everything else that goes deeper than that will put you into trouble. You have a platonic relationship with money, respecting its value(s) and being indifferent towards it at the same time — as Anton Kreil explains. Even though both are platonic, they are very different in one major point: The human relationship is potentially bidirectional while the money relationship you have is always a one-way street and will never be mutual. Money does not think anything of you, whether good or bad. Nothing. The only one who makes drama around money is you. Also, your sense of being the owner of money (sometimes obsessively) is because you think you can own money. But money does not have an owner, it never had. Money has always been best when in movement — impossible to catch (like a slippery eel) and therefore never in hands of someone for too long. Money needs to be a steady stream so it can make it into the open sea, vaporize and rain down forming a new stream. If you do not understand money as being in a permanent state of flux, you have no chance to be platonic about it. 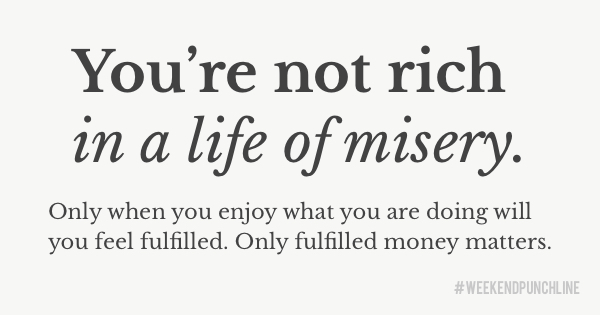 A feeling of missing money is an indicator that you did not. Only with a basic understanding of the function of money (and neither glorifying nor denying its importance for a functioning world) can you get that how much money you make does not count but how you make the money. If you have become a platonic friend with money (remember: money does not friend you back), an amount of money will not impress you. You will start to see what it really is: numbers on a screen or on paper that allow you to build wealth and sustain a working financial market and economy. How much money you make is of no significance because you will make any amount you want when you are willing to go the required way. Are you willing to make the sacrifices it entails? Making money means to work hard, be patient and save — A LOT. The journey how you made the money is what counts. You want to feel fine during the money-making. You want to enjoy the process, execution, hard work, conversations, struggle, pains, headaches and the fires you will fight. You want to feel fulfilled doing what you are doing now because here is a secret: When you are not fulfilled in this moment of your life doing what you are doing to create your wealth, you will be miserable anyway (with a shitload of money or without). Your job is not to make money because you cannot and never will. Your job is to provide an insane amount of value repeatedly and continuously over decades after which you are allowed to pick up the money laying on the street. Again: The question is not how much money you will make — because you will make as much as you want. The question is how you will make the money and how much you enjoy the hard part (or even consider it fun). This was episode 27 of the #weekendpunchline . Every Saturday and Sunday.